Home » How to Activate DraftSight? First of all go to DraftSight.com and Download Latest Version of DraftSight depending upon you OS . Check Latest Release version of DraftSight. 1. On Installation window default ‘Stand-alone License’ option is selected. If you want install Free DraftSight then Don’t change this option and Select ‘Next >’ tab. If you are Professional user of DraftSight then also you need to Select ‘Stand-alone License’ option to activate DraftSight professional. 3. Once you finish the Installation then following window will pop up. Following pop up will appear! If no Pop up message as above and DraftSight opens normally means your activation information is not sent to DraftSight. There may be several reasons Do following steps to troubleshoot issue. .
– At this point check that your internet connection is working properly . – You haven’t set Proxy details of your network correctly. – DraftSight Activation server is not Responding or down. – If you are working on VM machine then there may be some issue if VM is not correctly configured. 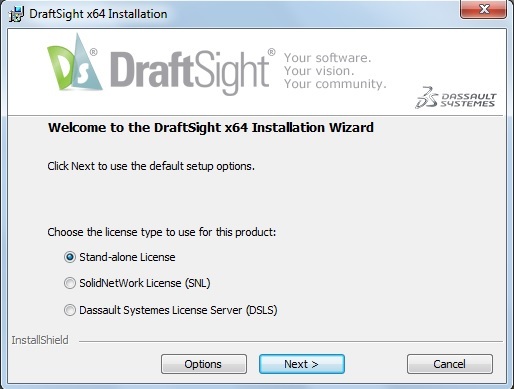 After checking this Double click on DraftSight icon on Desktop or from Start > Programs and Repeat Step 3 again. If you see above pop up message then Click Ok . If you want to activate with different Email id then click ‘Yes’ or if you want to wait for email then click ‘No’ and Start Working on DraftSight. Remember: Activation Should be Completed withing 30 Days . DraftSight User Interface (UI) is very User Friendly and Simple.